Movement is a life-long activity; therefore it is important to teach our toddlers and preschoolers about sports, fitness, and movement. This is a fun week of open-ended play, watching and playing sports, and exploring how our bodies actually move and work. For us, this also correlated with the start of football season, so what better time to kick off a sports theme? Thank you for purchasing through our affiliate links! This is a great week to revisit some of the ideas from the learning body parts unit. 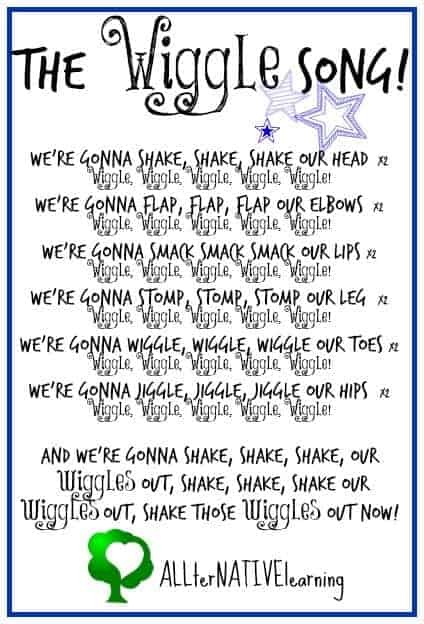 In fact, the wiggle song (below/to the right) is from that week and is a fun way to recap some of what was learned from body parts, but also a great way to get some movement into the week. Feel free to use and print it! Utilize the outdoors and parks to go on hikes, bike rides, swing, run, jump, climb, and more. 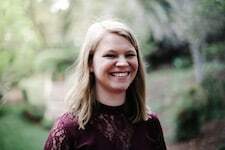 Golden Reflections Blog has a great resource explaining why physical activity and gross motor skills are important for your child’s development. Thinkfun Roll and Play Board Game and/or Move and Groove Dance Game are both phenomenal and fun ways to get little ones moving and having fun while doing it! Play with a Bilibo. It’s a great toy in terms of open-ended play because it forces creativity and encourages movement. My daughter loves to play with hers! She stands on it, sits in it, spins in it, and does all sorts of fun movements with it. Learn the signs for different sports. My daughter loves Signing Time and we learn lots of signs in American Sign Language to help facilitate our weekly learning themes. This one was her favorite week to learn the signs for! Consider getting a balance board or making one. 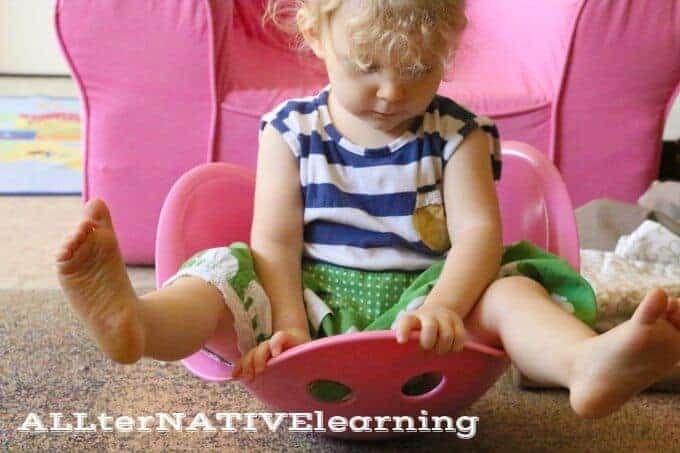 This is a great way to work on both gross motor development and focus. Some words to consider implementing this week are as follows: football, baseball, basketball, biking, soccer, tennis, hiking, walking, running, spinning, twirling, jumping, swimming, the Olympics, World Cup, Super Bowl, etc..
Go through my 10 easy gross motor skills for toddlers to not only get them moving, but encourage proper development. Go on a bike ride – my daughter loves to ride her little bike around. Though hers is a wooden trike with no pedals, it’s great gross motor development and gets her moving. Take a daily walk each morning or evening. This is just great time to spend together as a family, but also gets you moving. You might even talk each day about what you are going to learn/have learned and how life-long physical activity benefits us. Make your books “come alive” by acting them out. Choose any book and see if you can get up and make it about movement instead of just sitting and reading. Play with a Bilibo and let your child choose their own movements whether to stand, spin, sit, rock, climb, etc.. It doesn’t seem like much, but it really brings her so much joy and there are so many activities she has done herself with it. Go to a local sporting event. 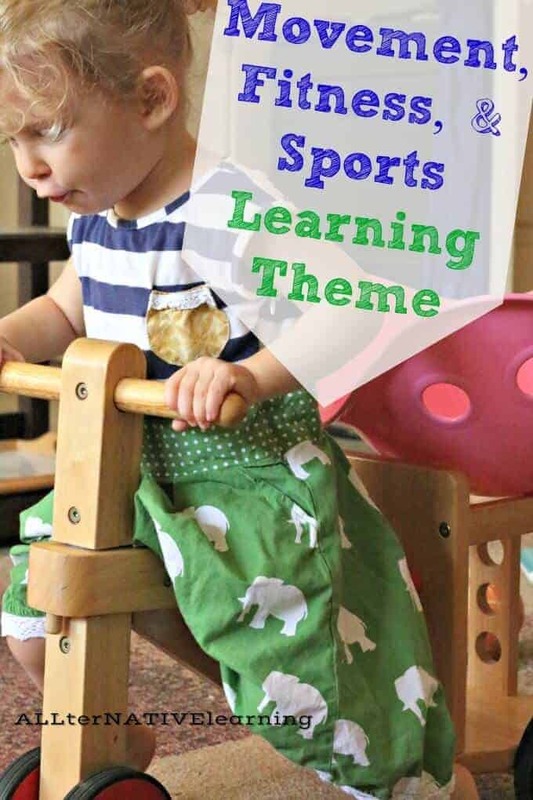 Whether it’s something big like a professional sport or just a high school game, this is a great way to get your little ones interested in sports and fitness. Lift weights together. Obviously the ones for your toddlers would be something like half pound ankle weights. This would be a great discussion on getting our muscles healthy and strong. Organize other toddlers and preschoolers to play soccer or another sport together. Even just kicking the ball around would be a fun way to learn and play. See more weekly learning themes here.